The Bhagavad-Gita is probably the most popular - and certainly the most frequently quoted and widely studied - work of the Hindu scriptures. This book investigates the relationship between the various interpretations of the Bhagavad-Gita and the Hindu tradition. Taking into account a range of influential Indian and western thinkers to illustrate trends in writing about the Bhagavad-Gita including Western academic; Indian activist; Christian theological; Hindu universalist; perennialist mystical and contemporary experiental accounts. Examining the ideas of such influential figures as F Max Muller, M K Ghandi, Bede Griffiths, Swami Vivekananda, Aldous Huxley and Swami Bhakivedanta, this book demonstrates the inextricable link between different interpretations of the Bhagavad-Gita and images of the Hindu tradition. This accessible book aptly demonstrates the relevance of the Bhagavad-Gita for an understanding of Hinduism as a modern phenomenon. 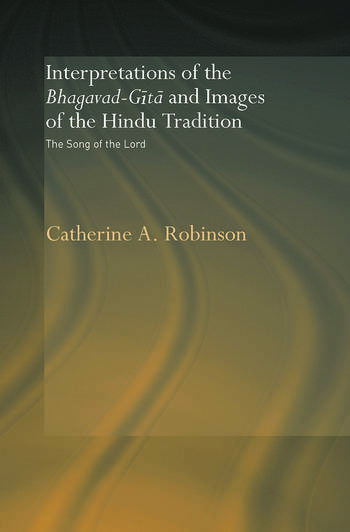 Catherine A. Robinson is Senior Lecturer in the Study of Religions at Bath Spa University; she is the author of Tradition and Liberation: The Hindu Tradition in the Indian Women's Movement (also published by Routledge).